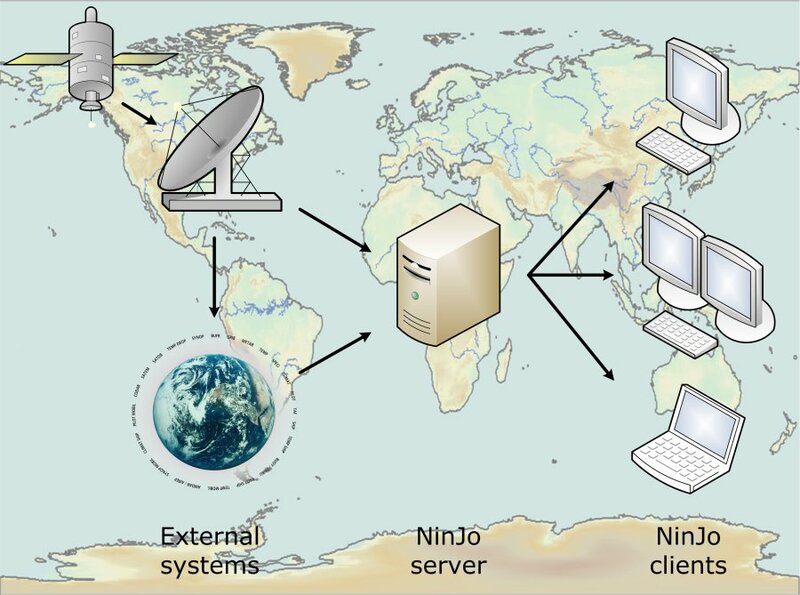 NinJo was developed by a consortium of National Meteorological Services with assistance of experienced IT companies. The involvement of the different partners in the development of the system ensures both its broad applicability and its continued maintenance. It also ensures that recommendations and requirements of users, configurators, administrators and IT specialists are considered in the development process. 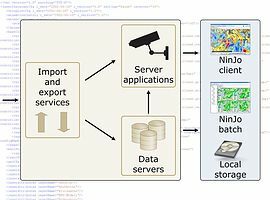 As a result, NinJo already encompasses a wide range of the functionalities expected from a workstation system used in operational meteorology. Furthermore, customer-specific functionalities can easily be incorporated into the system. editing the data and products. NinJo is a client-server system built using an extremely modular and scalable design. On the client’s side there is the interactive NinJo application, which is installed locally on the user's computer. Batch applications can be implemented on the server as well as on the client’s side. All other data is managed by the relevant server entities and administered centrally. The import/export modules for the different data types as well as decoding of the incoming data also run at the server level. Optional integration of the GloBUS decoding system allows further optimisation to be achieved. GloBUS was developed on behalf of the German Meteorological Service (DWD) for processing incoming data. NinJo is open for future developments. The system can easily be extended by further layers and applications according to user-specific requirements. NinJo is programmed entirely in JAVA. As a result, the workstation system can be installed on different operating systems (e.g. Unix, Linux and Microsoft Windows). This avoids the necessity of porting the source code onto a specific operating system. In principle, NinJo is able to run on any computer, be it a laptop or a supercomputer. However, adequate hardware for the expected volume of data is necessary. Both the client and server platforms need to have sufficient main memory and processor speed. In addition, a sufficiently fast network connection is required. NinJo relies on some external systems, e.g. for file handling, decoding of meteorological reports and bulletins, document management and scheduling. the Production Services, e.g. for the NinJo Batch System, Application Servers or Web Services. Configuration of NinJo Batch products. NinJo consists of many individual components. NinJo receives data from different sources and in various formats. PyTROLL to preprocess data from geostationary and polar orbiting satellites. After the import, the data is stored on the data servers and also made available for server applications, such as the Event Service for the automatic warning procedure AutoMON. The NinJo Server then provides the data to the NinJo Client applications. Visualisations are only generated when the query is posed. Thus, they are always up-to-date. The used hardware platform should be Intel or AMD based and have a x86 architecture. Both 32-bit and 64-bit systems are supported. The NinJo software is client/server based. On the server side, the NinJo Servers and Services can be distributed on several machines comparable to a grid computing cluster. For higher data throughput, it is recommended to use a two server setup and distribute the various Servers and Services on these two machines. Both server and client software run on Windows and Linux systems. 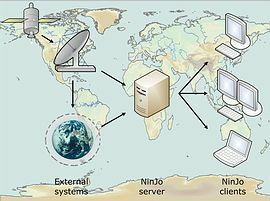 Commonly, the NinJo Server runs on Linux, the NinJo Client on Windows. It is also possible to use Linux for the NinJo Clients or a Windows server for the NinJo Server. 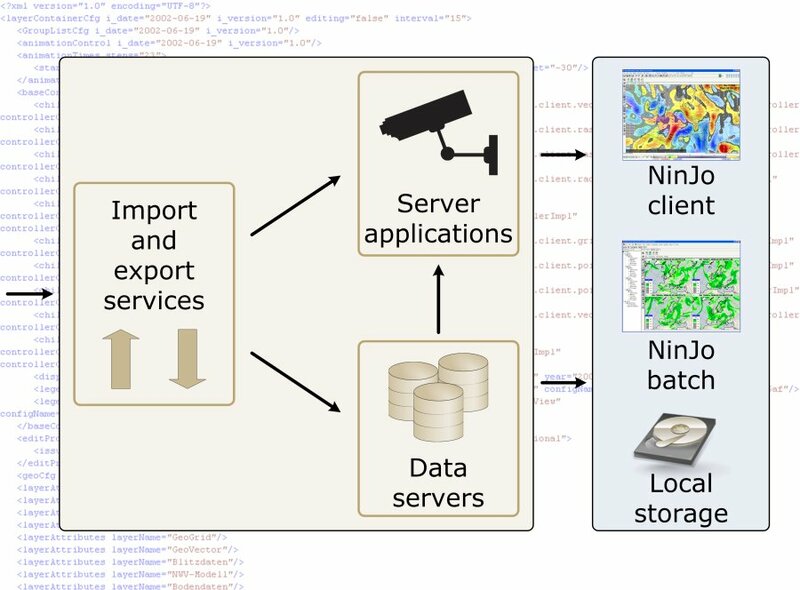 As NinJo is used internationally, a large number of different data types is already integrated into NinJo. NinJo has a very modular and scalable design. Therefore, new data formats for visualisation in the existing layers can easily be integrated upon request. All GTS WMO alphanumerical code forms and BUFR code forms (BUFR3 and BUFR4) are decoded for NinJo by GloBUS4NinJo. Other formats are easily integrated (e.g. FIMOS (DWD point forecast). NinJo contains a set of pre-configured maps. You can easily extend this set to suit your own needs using the MapCreator tool, which is also part of NinJo.